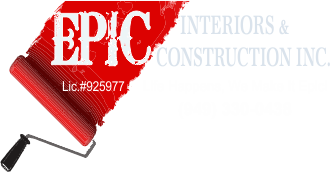 General Contracting | Remodeling | Epic Interiors & Construction Inc. Here at Epic Interiors & Construction Inc. we offer complete design and remodel construction services. As a full service General Contracting Company we are a design/build, and reconstruction firm with a professional staff, experienced contractors, predictable time lines and surpassed client expectations. From blueprints to final touches, our team will create the kitchen remodel, bathroom remodel or room additions you’ve always wanted. In addition to traditional training and experience, our staff is certified in multiple green building practices, and restoration services providing you with options that can make your home healthier and more efficient to live in. It is our commitment to build quality and trusted working relationships that last..
Epic Interiors and Construction Inc, has been in business since 2008, we are a General Contractor Specializing in Room Additions, Kitchen Remodels, Bathroom Remodels, Flooring Installation and Water Damage Repair In Orange County, CA. Epic Interiors and Construction Inc. prides itself on its relationship with the homeowner during their projects. Our customer’s homes reflect the imagination and craftsmanship we put into every one of our jobs. The remodel and/or building process bring many hurdles that need to be met and handled with the utmost professionalism and regard for the homeowner.